You are currently browsing the tag archive for the ‘Judaism’ tag. The photo was posted by a friend on Facebook. 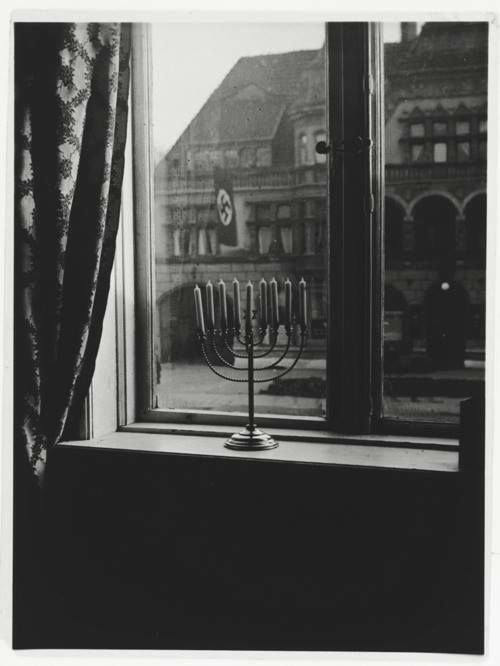 It represented as having been taken in Germany in 1931 – from the window of a German Rabbi looking across the street at a local Nazi headquarters. I don’t know the town. I would like to know more about the photograph. Does anybody have any information? Addendum: Somebody else sent me this video. I have no idea what it’s about. And another friend sent me this. Somebody reviewing one of Michael Moore’s movies once commented that while Moore’s ability to drive entire audiences to a standing ovation is a notable feat, a film maker who is a true artist ought to prefer that his/her film has audiences arguing in the aisles as the credits roll. I thought it was a good point, but I was hard-pressed to come up with a documentary film which could accomplish just that. And then, recently the recommendations robot at Netflix directed me to a documentary film entitled Arguing the World. In terms of stimulating thought and argument about the larger political issues, I can think of no more effective documentary film. The film focuses on four dynamic figures of a group which became known as the New York Intellectuals, characterized primarily by Jewish ethnicity, radicalism in youth tempered by anti-Stalinism, cultural critique in middle age, and anywhere but anywhere in old age. The four are Irving Howe, Irving Kristol, Nathan Glazer, and Daniel Bell. They were all raised in poverty in Jewish ghettos in New York City. They met at City College of New York during the 1930s. City College became known as the “Jewish Harvard,” because of the prominence of working class children of Jewish immigrants who would ditch poverty as adult career intellectuals. As legend has it, the professors themselves were mediocre, but the students would read and learn through arguing with each other. The dining hall contained various horseshoe shaped alcoves, and each one was claimed by some sort of clique (jocks, Catholics, etc.). As it happens Alcove One was perennially occupied by anti-Stalinist socialists, either Trotskyist or Second International variety (the SWP and SP actually merged for awhile, weird as that sounds to modern students of sectarian politics), while Alcove Two was occupied by the Communist Party activists and their fellow travelers. Often there were arguments and even altercations between the two, but more often each group kept to itself. The Alcove One denizens infused literature readings into their politics, lacing their Marxist analysis with smatterings of Dostoevsky, Proust, T.S. Lewis, the Bronte sisters, etc., and moved beyond even the Frankfurt School of Marxism in the blending of cultural criticism with politics. The subculture was also characterized by intense arguments, sometimes stimulated by alcohol consumption (a darker aspect of the old left which is known to the families but not often discussed even in the narrative histories). These four began as Trotskyists, which leads me to my favorite quote in the film (I’m not quite remembering who said it): “We didn’t know he [Trotsky] was right. We only knew he was interesting. And in the Village then, to be interesting was to be right. Certainly to be uninteresting was to be wrong. And I’m not sure I don’t still hold to that.” I have to admit that I probably hold to that as well, as I frequently find my self disagreeing even when I agree. And Trotsky was a more interesting figure than Stalin, or even Lenin, and certainly more interesting than Norman Thomas (you get to see a rare clip of a Thomas speech in the film), though maybe not quite as interesting as Debs or Shachtman. As they got older and left CCNY, the four, and others, pooled resources and joined as writers a magazine entitled Partisan Review – intending to be a literary magazine with a political philosophy emphasis. Now the film doesn’t get into the history so much, but Partisan Review actually has roots in the Greenwich Village intellectual milieu, which included John Reed, Max Eastman, and the Masses Crowd, and it may overemphasize a bit the divide between Alcoves One and Two in the broader sense, but perhaps not as it applies to these four individuals. They were integral to the formation and development of Commentary Magazine, which began as an attempt to integrate Jewish radicalism into American democratic culture with complex cultural criticism, but the magazine ultimately slid into a more straight-jacketed ideological neo-conservatism, and exists now as a shadow of its more intellectually challenging past. But by the time the four were writing for Commentary, all of them, including Howe, had abandoned their CCNY-era radicalism and embraced a more skeptical and pragmatic liberal outlook, which sent them into different directions. 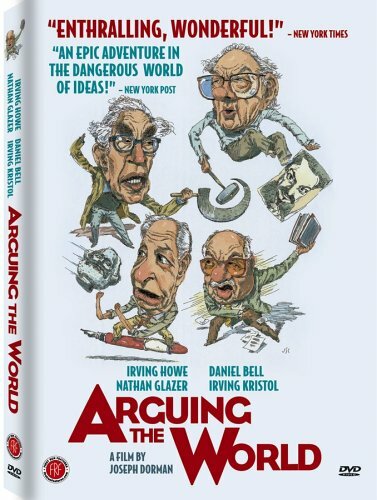 The film examines the directions they took and attempts to find answers to the question of why like experiences could leave Irving Howe in the socialist fold (even if most self-proclaimed socialists regarded him as neo-conservative) while pushing Irving Kristol into the the Reagan camp. When McCarthyism came into full swing, these intellectuals found themselves in a tight spot. They had become anti-communist to the point that they were slamming not only the C.P. itself for its ties and loyalty to the Soviet Union, but also the liberals who downplayed the American communist’s complicity with the mass killings carried out by their more “successful” Soviet counterparts. None of the intellectuals’ was particularly enamored with McCarthy as a matter of style, but while Kristol protests that he referred to McCarthy as a “vulgar demagogue” while implicitly supporting the carnage McCarthyism was wreaking on innocent people and the culture at large, he and other Commentary writers did not object to the underlying witch hunt process which ruined the lives of people who had been guilty of nothing more than attending socialist meetings while in college. At this point, Irving Howe broke away from many of his friends; and while slamming communism and even to some extent defending American culture, he attacked McCarthyism on civil liberties grounds- a frame that the others were unable or unwilling to adopt. Their defensiveness as exhibited in the interviews of the film is remarkable. On the one hand they protest that they did in fact “question” methods being used, but on the other felt that some sort of process was necessary. Howe and other anti-Stalin socialists started the independent socialist quarterly Dissent (there is a recurring theme in the film that when Intellectuals don’t know what else to do, they start a magazine). The idea was to revisit socialism as a goal or a hope in a non-ideological manner, and outside of the auspices of any particular organization or program, while maintaining critical independence of thought and analysis. Kristol dismissed it as ideologically anachronistic and irrelevant, but by the time he was asked to comment he had already turned to the dark side and it’s unclear whether he was at that point unable to segregate his personal opinions from his political agenda. But the debate raged and an indication of the prominence of the debate in the NY Jewish subculture came a couple of decades later when Woody Allen, either unaware or uncaring that the reference was somewhat obscure on the national level, dropped a line into his acclaimed movie Annie Hall referencing a peace reached between Commentary and Dissent so that they merged to form the magazine Dysentery. Of the millions who have watched the Academy Award winning film over the decades since, probably only a fraction of them understand the reference. But that it made it into the movie is an indication of how strong the debate was in NY Jewish subculture. The documentary then moves into the 1960s and the contentious relationship between the NY Intellectuals and the New Left. It doesn’t go into the initial discussions where Howe’s protege Michael Harrington attended the Port Huron conference and left with some frustration. The episode is described in some detail in Maurice Isserman’s If I had a Hammer, which is a brilliant summary of the history of the American Left. The film covers mostly the summit talks between Dissent and SDS. Howe and Glazer describe their interactions with upstart activist Tom Hayden, whom they regarded as a potential totalitarian – romantic utopian politics within a good looking guy completely into himself. The Intellectuals were paternalistic and condescending. The New Lefties were charged and emotional. It didn’t go well. There are interviews with New Leftists including Hayden and Todd Gitlin, and you can tell that it’s still a sore point. My religious studies professor in college (Noel King, who died last year :&( ) referred to Judaism, Christianity, and Islam as the “quarrelsome family of a mother and two daughters.” And it could be argued that Judaism and Islam have more in common with each other than either with Christianity (“there is no god but God” is a quote in reference to what some of them perceive to be the polytheism of the Christian trinity). But over the past few decades it has become fashion in Christian fundamentalism to deem Jews automatically saved (a serious point of contention). So with at least the facile elements of anti-semitism in check, why was there never a Seder held in the White House before last year? Nixon had problems with Jews, but what about the other presidents? Boggles the mind. Kudos to Obama for doing it, without making a huge deal out of it. Maybe it’ll become a permanent tradition. Sure, it’s merely symbolic. But this is some powerful symbolism. I wonder if they put oranges on the Seder plate. Anyway, the New York Times provides the brief history (including the WH protocols compromised to accommodate last year’s Seder) leading into this year’s event. 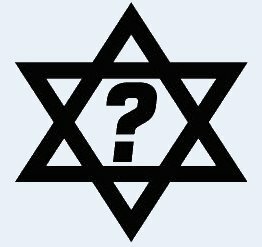 Why are so many Jews liberal? I’ve explored this question before, though not nearly with the depth that a thinker like Michael Walzer approaches the question. In this Dissent article (yes, I’m catching up with the Dissent copies next to my bed) he explores all the theories. Perspective of a history of cultural marginalism; practical necessity of a tolerant, open, liberal society; The powerful imagery of Exodus and the Passover traditions; The theological triumph of Hillel over Shammai; cultural values underscoring education and intellectualism; philosophies and theologies which do not shy away from ambiguity; communalism of closed communities; social identity; etc. AT THIS point, I would like to make a more personal argument—that of a participant-observer in Jewish diaspora politics—in favor of the survival and continual re-invention of Jewish liberalism. Many critics of diaspora Jewry would go further today and argue that the historic memories, since they are only rarely cultivated, are themselves fading and that we are indeed becoming a banal minority. The Jews are one more interest group, different from the others only in the obvious sense that our interests sometimes conflict with the others’—as is happening in the U.S. in the case of Jews and their relations with American blacks and Hispanics. Such conflicts can impose a certain transient unity on the different groups, but they are unlikely to revive heroic memories. Walzer goes on to argue that Jewish neoconservatism embraces the interest group reduction, defending “only Jewish interests and not Jewish values,” resulting not only in the near totality of cultural assimilation, but the loss of an history. Food for thought. I’m pretty sure that means Happy New Year, otherwise known as Rosh Hashanah. Podhoretz’s book was conceived as the solution to the puzzle that Milton Himmel­farb wittily formulated many years ago: “Jews earn like Episcopalians and vote like Puerto Ricans.” I have never understood the reputation of this joke. Why should Jews vote like Episcopalians? We are not Episcopalians. The implication of the joke is that political affiliation should be determined by social position, by levels of affluence. In living rich but voting poor, the Jews of America have failed to demonstrate class solidarity. Never mind that parties of the right in many Western countries have always counted on the poor to make the same betrayal, and support causes and candidates that will do nothing to relieve their economic hardship but will exhilarate them culturally or religiously or nationally. It is not a delusion, not a treason, to vote against your own economic interest. It is a recognition of the multiplicity of interests, the many purposes, that make up a citizen’s life. When, in the Torah of Judaism, Moses commands the Jews to perform acts of social welfare, he sometimes adds the admonition that they were themselves strangers and slaves. The purpose of this refreshment of their memory is plain. The fact that we are no longer stran­gers and slaves is not all we need to know. We may not regard the world solely from the standpoint of our own prosperity, our own safety, our own contentment. We are proven by the other, not by the same. The question of whether liberalism or conservatism does more for the helpless and the downtrodden, for the ones who are not like us, will be endlessly debated, and it is not a Jewish debate; but if the answer is liberalism, then the political history of American Jewry is neither a mystery nor a scandal. From an interview with the Christian Broadcasting Network. “One of the things I find most interesting is that generally Evangelicals are so much more supportive of Israel than the American Jewish community,” Huckabee, an ordained Baptist minister, said. What he leaves out is that much (not all) of the evangelical base support Israel primarily because it fits into their views of Biblical prophecy and the end days rather than any real affinity. But one TPM reader is even more to the point. The American Jewish community is divided about lots of things, it’s our nature. One thing we tend NOT to be divided about is support for Israel. But support doesn’t mean merely blind acceptance, which is something Republicans never seem to understand in general. We can support Israel while disagreeing–loudly and forcefully at times–about specific behaviors of its government. As an American Jewish liberal Democrat, I can support a 2-state solution (which, to my knowledge, remains official Israeli government policy), oppose the expansion of settlements, rail about Bibi’s government or at least his governing style, and still wholly, fundamentally support the state of Israel. And, you know what? I resent Huckabee and his ilk for implying that my support of Israel is anything less than total just because it doesn’t fit into his narrow prism of what he perceives that support should be. 4 percent increases in defense spending are cuts. And other than the occasional left wing talking heads comments shrugged off by the MSM interviewers who’ve bought into the Republican meme, only the Daily Show seems to be up on the arithmetic. Quite frankly, I wish there were cuts. 534 billion in capital-intensive, minimally stimulating, spending mostly to fight a cold war which ended almost two decades ago seems excessive to me. Call me a liberal. You have to use the link above. I can’t embed it right now. Meanwhile, does anybody remember Obama’s “Jewish problem?” Right wing talking heads, throughout the campaign, kept referring to his Jewish problem, namely that he wouldn’t draw their votes for various reasons. When election came around he drew 78 percent of the Jewish vote, only 4% more than Kerry received in 2004. Is 4 percent the conservative’s magic number which reverses the laws of arithmetic? 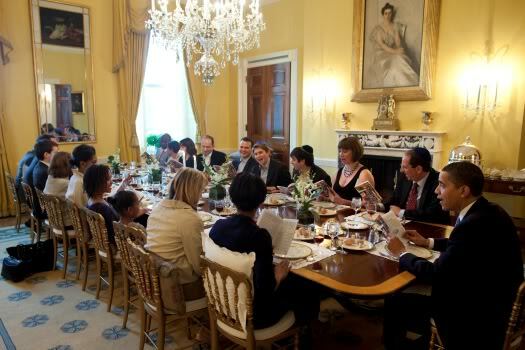 Meanwhile, Obama is holding and will attend a Seder dinner tonight. Someone on television last night said that it is the first time a Seder is being held in the White House in which the president will attend. Apparently he’s making it up to his staff, many of whom missed their family celebrations last spring due to a protracted primary fight with Clinton. I don’t know how many kids are attending, but I wonder if the youngest of Obama’s daughters will be the youngest attending and thus be assigned the task of asking the four Seder questions. If filmed, it could be a remarkable moment in the history of religious ecumenism. The statement comes from their website, and it pretty much reflects my views. Jewish Voice for Peace joins millions around the world, including the 1,000 Israelis who protested in the streets of Tel Aviv this weekend, in condemning ongoing Israeli attacks on Gaza. We call for an immediate end to attacks on all civilians, whether Palestinian or Israeli. Israel’s slow strangulation of Gaza through blockade has caused widespread suffering to the 1.5 million people of Gaza due to lack of food, electricity, water treatment supplies and medical equipment. It is a violation of humanitarian law and has been widely condemned around the world. This massive destruction of Palestinian life will not protect the citizens of Israel. It is illegal and immoral and should be condemned in the strongest possible terms. And it threatens to ignite the West Bank and add flames to the other fires burning in the Middle East and beyond for years to come. The timing of this attack, during the waning days of a US administration that has undertaken a catastrophic policy toward the Middle East and during the run-up to an Israeli election, suggests an opportunistic agenda for short-term political gain at an immense cost in Palestinian lives. In the long run this policy will benefit no-one except those who always profit from war and exploitation. Only a just and lasting peace, achieved through a negotiated agreement, can provide both Palestinians and Israelis the security they want and deserve. Addendum: Somebody linked me to this video entitled If the IDF made Hamas-style videos. It comes with the following explanation. Here is how I imagine an IDF video would look like if it was made like those cheesy Hamas jihadist videos that glorify terror, with bad music, poor sound effects and repetitive explosions. I haven’t seen any Hamas videos so I can’t judge, but I guess the real point is to prove that the IDF was targeting paramilitary operations. I don’t think there’s any serious doubt about that. But it also misleads, much like the first Gulf War footage, to suggest that these are “surgical strikes” and not an the overkill being suggested by a number experts. Here is a comment on the Youtube page (you can get there by clicking twice on the video). Good vid…& to extend the metaphor, imagine what would happen if the Palestinians had a wing of F-18 fighters. Would they just use them responsibly like the Israeli’s do and just protect their own land or limit their incursions to 40 miles into Israel like they are doing with their rockets? No, they would try to wipe out Israel as fast as they could. Who knows what they would do? They wouldn’t be fighting asymmetrical warfare, so they might actually act a bit differently. Then again, they might act like Franco with Guernica. Who knows? I’m not an expert. Some progressive views of the Feast of Lights, mostly with the help of the magazine Tikkun. Daniel Brook and Richard Schwarz argue that Jews should honor the holiday by becoming vegetarian. Rabbi Jill Jacobs sees the holiday as a triumph of memory over history (the most interesting of these links to me). Rabbi Michael Lerner cautions against the “smushing” of the holidays of Chanukah and Christmas. Here’s a guide to the celebration itself. Here’s a critique of the above-linked guide on the basis that it misrepresents the Hellenistic influence. Lerner responds that it is specifically the materialism of the Hellenistic influence to which he objects. The South African Union for Progressive Judaism expands on some of the political points. Here is an account of a Chanukah celebration attended by Palestinians. In a similar vein, this blogger requests that Palestinians be in the thoughts during celebrations. S/he asks when the Palestinians will get their Chanukah, but I would suggest they’re in more need of a Passover. And in this video Jewish Standup Comedian Yisrael Campbell pokes some fun at the rationales for certain rules about the ritual. As to the spelling, the “C” is an option but not a requirement apparently, and whether there is one “N” or two also appears to be unsettled, at least on the Internet. 2. Christmas is a major holiday. 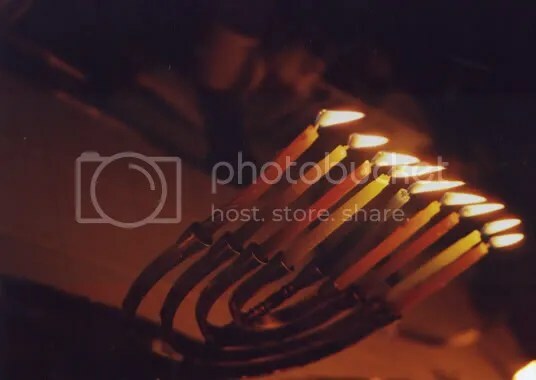 Chanukah is a minor holiday with the same theme as most Jewish holidays. They tried to kill us, we survived, let’s eat. 4. There is only one way to spell Christmas. No one can decide how to spell Chanukah , Chanukkah, Chanukka, Channukah, Hanukah , Hannukah, etc. 7. Christmas carols are beautiful…Silent Night, Come All Ye Faithful….Chanukah songs are about dreidels made from clay or having a party and dancing the hora. Of course, we are secretly pleased that many of the beautiful carols were composed and written by our tribal brethren. And don’t Barbara Streisand and Neil Diamond sing them beautifully?